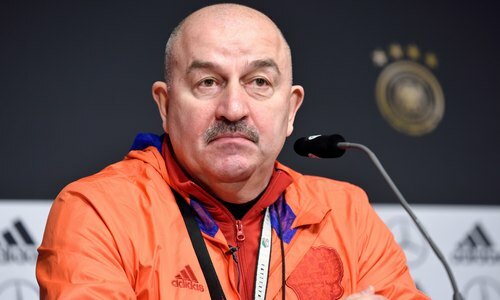 Russian national team coach Stanislav Cherchesov took questions from journalists at a press conference in Red Bull Arena press center on Wednesday, the 14th of November. - Who will appear as goalkeeper tomorrow? — What do you think about the lineup which is going to be very different compared to the one that played at World Cup? — We planned something else but that’s how things turned to be. Injuries happen to everybody and we cannot complain about this. Of course, we cannot be happy when too many players get to sit out due to injuries. On the other hand, other players are thus given a chance to show their worth. That's how we view the situation. — There are many young players in both Russia and Germany? Is it going to be more difficult for you or for your German colleague Joachim Löw? — I can’t say for sure about the situation within the German team. As for Russia, four players retired after the World Cup. And our team is indeed very young if Nababkin and Ari, both aged 32, are to be considered young. Every coach faces challenges and nothing can be ideal. But again, this means that other players are given a chance. For instance, Konstantin Rausch had to sit out the World Cup due to an injury but he is now in good health and ready to play. We select players who meet our requirements. — Which match is more important to you – the one against Germany or against Sweden? — The match against Germany has an image component and it is important for us to play against a top team. It is always desirable to play against top teams to know what you are really worth. We were criticized for our results in such matches before the World Cup but this justified itself in the end. The match against Sweden is important in that it allows to advance to the first division in UEFA Nations League. — What are the reasons for Germany’s failure at World Cup 2018? — You may remember that Kroos won the Champions League for three times in a row and there are many other players who advanced to late stages in Eurocup. So players are quite exhausted by the end of the season and it is quite difficult for them to show their peak performance at the World Cup. This may be one of the reasons. Another reason is that all opponents have an additional motivation when they play against Germany. But when I read that Germans have doubts about Joachim Löw’s coaching skills, I say that you are a great football nation indeed if you have many coaches better than Löw. It is quite difficult to replace a great coach like him. I worked under his supervision in Tirol and I know that he will analyse every single detail and build up a new team that is as powerful as the one that won the World Cup in Brazil. — What are the chances that you will play with three central defenders? — We still have time to think. The final decision will be taken after a theory class and dialogue with football players. We are not focused on a single tactical scheme but try all the different ones. — Why are you staying in Leipzig for three more days after the match against Germany? - The weather in Moscow is not quite suitable for trainings now. Weather conditions are better in Leipzig. And we rather avoid an extra flight. We are not flying to Stockholm immediately after the match because the number of days you spend in a city before the match is among factors that matter. If we were to spend too many days in Sweden, we could have forgotten what we are there for. — The decision to naturalize Ari has been criticized in Russia. How can you comment that? — We did not make any special requests to anybody to arrange a Russian passport. Ari played in Russia for 9 years, it was his own decision to apply for the Russian citizenship. We found his football skills suitable to our requirements. And we now have a chance to see what kind of person he is. He might be Brazilian for you but he is a Russian for me. And by the way, we did not ask Rausch to apply for Russian citizenship either. — Roman Pavlyuchenko said he was offended by the fact that Ari is invited to the national team. He said he would stop watching national team matches on TV. What do you think about that? — We live in the same house with Roman. Some five meters from each other. I will meet him for a cup of tea after we are back and explain my decision. I am sure we will find some kind of agreement on that. Pavlyuchenko is an important figure in the history of the Russian national team. That may have been emotional of him to say that.